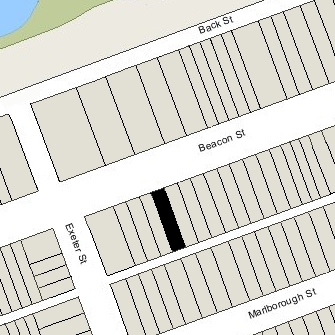 287 Beacon is located on the south side of Beacon, between Dartmouth and Exeter, with 285 Beacon to the east and 289 Beacon to the west. 287 Beacon was designed by architect George A. Avery and built in 1881-1882 by Warren Dexter Vinal and Charles A. Dodge, masons, for speculative sale, one of two contiguous houses (287-289 Beacon). Vinal & Dodge are shown as the owners on the original building permit application, dated June 20, 1881. 287-289 Beacon were built on two 24 foot wide lots which the Commonwealth of Massachusetts conveyed to building contractor George Wheatland, Jr., on January 24, 1882. The Commonwealth originally sold the land at its public sale on November 26, 1866. George Wheatland, Jr., either was the successful bidder or subsequently acquired the right to buy the land from the successful bidder by August 10, 1881, when he entered into a party wall agreement with John Francis Anderson, who held the right to purchase the lot at 285 Beacon. It appears that George Wheatland, Jr., entered into an agreement with Vinal & Dodge to build 287-289 Beacon on the land and, when they were nearing completion, he exercised his right to acquire the land from the Commonwealth. He retained the house and land at 287 Beacon and transferred the house and land at 289 Beacon to Vinal & Dodge, who then sold it. Click here for an index to the deeds for 287 Beacon. On September 15, 1882, 287 Beacon was purchased from George Wheatland, Jr., by Marian Glyde (Bigelow) Horton, the wife of coal merchant Henry Kenny Horton, Jr. They had lived at 7 Exeter during the 1880-1881 season. They continued to live at 287 Beacon during the 1885-1886 winter season, but moved soon thereafter and were living at 9 Charles at the time of his death in December of 1887. By the 1888-1889 winter season, Marian Horton was living at 341 Beacon with her mother, Anna Smith (Miller) Bigelow, the widow of George Tyler Bigelow. By the 1886-1887 winter season, 287 Beacon was the home of wholesale dry goods merchant Daniel Denny and his wife, Mary DeForest (Bigelow) Denny. They previously had lived at the Hotel Vendôme. They also maintained a home in Milton. Daniel Denny’s unmarried brother, Clarence Holbrook Denny, lived with them. He was a wool dealer. 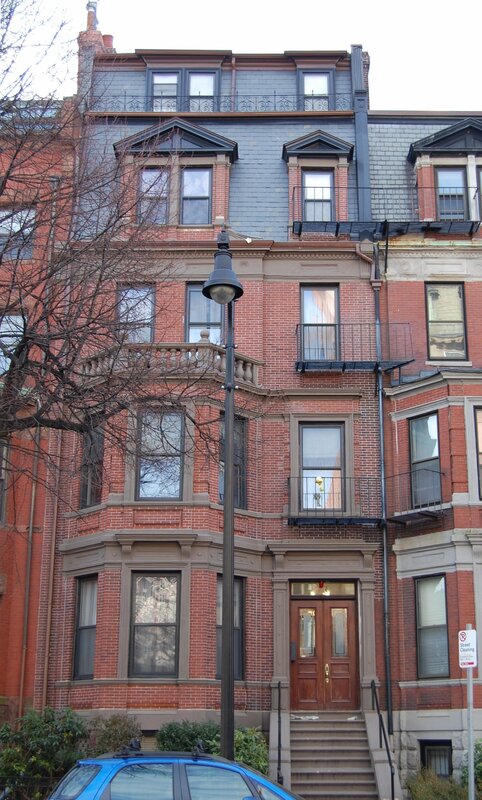 They continued to live at 287 Beacon during the 1887-1888 season, but moved thereafter to 8 Gloucester. On September 10, 1888, 287 Beacon was acquired from Marian Horton by Dudley Bowditch Fay. He and his wife, Katharine (Gray) Fay, made it their home. They previously had lived at 227 Beacon. They also maintained a home in Nahant. Dudley Fay was a trustee. He also was a noted expert on ancient Greek and Roman coins. Dudley Fay died in February of 1921. In his will, he left 287 Beacon and their home in Nahant in trust for the benefit of Katharine Fay. Katharine Fay continued to live at 287 Beacon. The Fays unmarried children – Rosamond Fay, Arthur Dudley Fay, a teacher at Fessenden School in Newton, and John Howard Fay, a medical student — lived with her. Rosamond Fay married in July of 1922 to Henry Bernard Montagu, a British naval officer; after their marriage, they lived in England. John Fay married in July of 1926 to Madeline Thomas Beals and they moved to 108 Charles. Katharine Fay and her son, Arthur, continued to live at 287 Beacon. In about 1935 she was joined by her daughter, Elizabeth Bowditch (Fay) McGann, the widow of Dr. Pierce Powers McGann. Prior to her husband’s death in October of 1932, they had lived at 307 Beacon. Elizabeth McGann died in October of 1938. Arthur Fay continued to live with his mother until the early 1940s, when he appears to have made Nahant his primary residence. Sometime prior to 1942, an additional story was added to the house. Katharine Fay continued to live at 287 Beacon until about 1954. On December 7, 1954, 287 Beacon was acquired from the trustees under Dudley B. Fay’s will by real estate dealer Samuel Wasserman, and on the next day he conveyed the property to Joseph Hunter, trustee of the J. Hunter Realty Trust. In January of 1955, Joseph Hunter applied for (and subsequently received) permission to convert the property from a single-family dwelling into twelve apartments. On November 1, 1978, 287 Beacon was purchased from Joseph Hunter by real estate broker and investor Patrick J. Glynn and Garrett Griffin. On January 22, 1991, Patrick Glynn and Garrett Griffin transferred the property to themselves as trustees of the 287 Beacon Street Trust. 287 Beacon remained an apartment house in 2016.